The 1st – 7th June is National Volunteers Week. 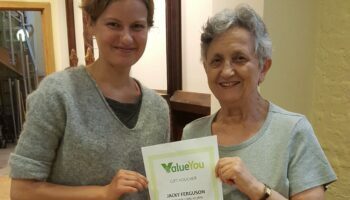 To celebrate the work of our volunteers, and to highlight the benefits of volunteering, we spoke to Jackie, one of our Dignity Champions, and active member of her Patient Participation Group. What inspired you to become a volunteer? In 2014 I was asked to represent my Patient Participation Group at a Healthwatch event where I heard about the work of Dignity Champions. This was something I was particularly interested in at that moment as I had been caring for a friend during the previous four years at the end of which she needed to go into a care home. I viewed about ten homes in the local area before finding one that was suitable. I felt therefore that I would like to do something that would make a difference and being a Dignity Champion seemed to provide the ideal opportunity. What kind of things do you get involved with? My main involvement is as a Dignity Champion accessing various facilities, also as a PPG member attending overarching meetings of PPG representatives in the local area. How does volunteering make you feel? Volunteering gives me great satisfaction as it is an opportunity to give back something to the NHS and other organisations in return for the services I have received over many years. What kind of people have you met? I have met all sorts of interesting people who manage to stay cheerful in spite of having many problems. Has Jackie’s story inspired you to volunteer with Healthwatch Central West London? If so, find out more.